1盎司2012债务与死亡银圆 Buy the 1 oz Debt and Death silver round at the best price online, we ship worldwide. This was the first round released by Chris Duane. 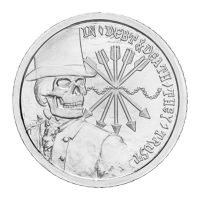 The obverse features a skeletonized skull of a banking gentleman along with the signature top hat. The phrase "In Debt and Death they trust" is engraved on the round, mimicking the "In God we trust" present on many US coins. The chain of debt slavery and the five arrows of the Rothschild family crest complete the obverse design. The reverse features the original Silver Bullet Silver Shield crest design and the engraved words "Silver Bullet Silver Shield A Conscious Solution to Collectivist Problems" on the outside of the crest. Inside the crest is the personal mantra of the coins designer, Chris Duane, "Listen to All Follow None" and the weight and purity. The artwork for both sides by Heidi Wastweet has now become a virtual calling card for the series. This design launched the whole Silver Shield series, order yours today!